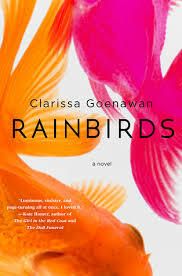 In her debut novel “Rainbirds,” Clarissa Goenawan explores the relationship between Ren Ishida, a Japanese graduate student, and his sister, Keiko. The novel begins with Ren learning of his sister’s murder. Her shocking death makes him question his understanding of her as an innocent girl. The novel portrays different periods of Ren’s life, shifting between present day and various snippets of past experiences with Keiko. Ren makes realizations as the novel unravels the burgeoning secrets that Keiko concealed from Ren. Goenawan uses her experiences as a short story writer to her advantage, weaving together a complex string of events that are seemingly unrelated, yet mesh perfectly. Goenawan writes achronological sequences that are both easy to follow, yet fascinating to experience. She avoids revealing details about Keiko and her murder in the typical murder-mystery format. Instead, current events in Ren’s life trigger memories of Keiko that slowly unfold to piece together her story. The connections between his memories and his present experiences are so strong that the pair buoy each other to benefit the overall plot. The format that Goenawan chooses takes apart the standard novel structure and replaces it with a thrilling unraveling of a single, complex mystery. Through the mixing of timelines, Goenawan also manages to interweave distinct lives and experiences into a single entity. She explores the deep thoughts of multiple characters within single chapters, giving the reader multiple perspectives of similar events. Ren has faults—Goenawan makes him human and presents him exactly how he is. Furthermore, she discusses relationships between different characters by carrying themes between them. Characters explore faulty relationships in distinct ways, showing Goenawan’s compelling thoughts in different areas. Some of Goenawan’s prose reads awkwardly throughout the text, especially in her descriptions that clearly lack any sort of imagery. Goenawan will throw in a sentence revealing important emotions: “I wished everything that had brought me here had been a dream.” From there, Ren will immediately launch into thinking about the “prominent politician” Mr. Katou. However, this choice matches and benefits the story’s development. On a basic level, the simple and somewhat graceless prose deadens the scenes, contributing to the atmospheric effect. More importantly, it provides the reader with a way to further understand Ren’s point of view: As he discovers different clues and ideas, Goenawan brings various thoughts and memories to the surface in an unwieldy, but fitting, manner. Ren does not understand clues about Keiko’s life in a logical way, but rather by a character shocked and confused by the revelations. Ren’s experiences draw the reader in as he continually exhibits his shared lack of understanding. Beyond the novel’s structure, the plotline itself is intriguing and unique. The twists the story takes are unexpected, but logical. Goenawan is not afraid to experiment with the story’s directions, while still creating a satisfying narrative. She does not attempt to have a single concept carry the entire novel. Instead, she treats the story as a true life experience, often adding in details that seem unimportant, but significantly contribute to the novel’s base atmosphere and structure. This concept makes the story unpredictable and creates a riveting plot. Goenawan succeeds in writing a novel that has the feel of a short story collection seamlessly weaved together. In “Rainbirds,” she uses her unique strengths to create a spellbinding murder mystery.